I was glancing through old posts, and found it’s been more than five years since I reviewed the original Star Wars trilogy…which was well before all the new developments in the franchise, when the expanded universe was still canon, there were only three movies (that wasn’t a typo) and Star Wars was much less on my mind. More than any other Classic Review I’ve posted, this one feels like it was really from a different time in my relationship (because there is one) with what I’m reviewing. As discussed below, I’m still a Trekkie first, in the great debate. But this kicked off a lot more reading (or rereading) of Star Wars books, and I happen to be in a book club that frequently winds up discussing Star Wars. And, you know, things happened in the franchise. So I’m definitely more into Star Wars now than I was when I wrote this. The sci fi kick I’ve been on lately has led me back around to Star Wars, which I must admit I haven’t paid much attention to for about ten years–and it had probably been that long since I watched the original trilogy. First, a little history. 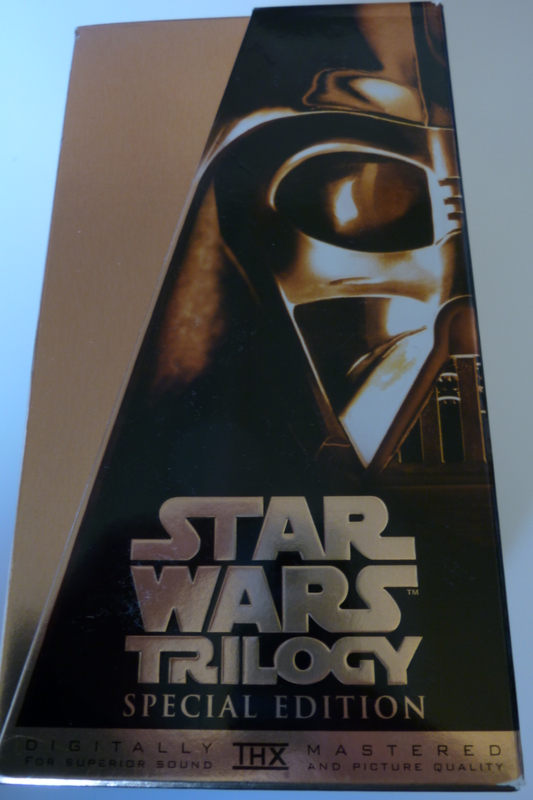 The trilogy was re-released in theaters when I was in elementary school, and me and everyone around me became Star Wars fans. I read probably 10 or 12 Star Wars books too, but lost interest when it began to feel like every book was basically “let’s mop up the last traces of the Empire…and then the last last traces…and then this last one…” More significantly, I also found Star Trek. For me, the fandoms co-existed for a while, but in the end, the traveling turned out to be more interesting than the fighting (I’m convinced the difference really is all in that second word of the names). All of this is to say that I identify as a Star Trek fan, but I like Star Wars too, and there was a time when I really liked Star Wars. And lately I’ve been thinking I’d like to revisit the galaxy far, far away. 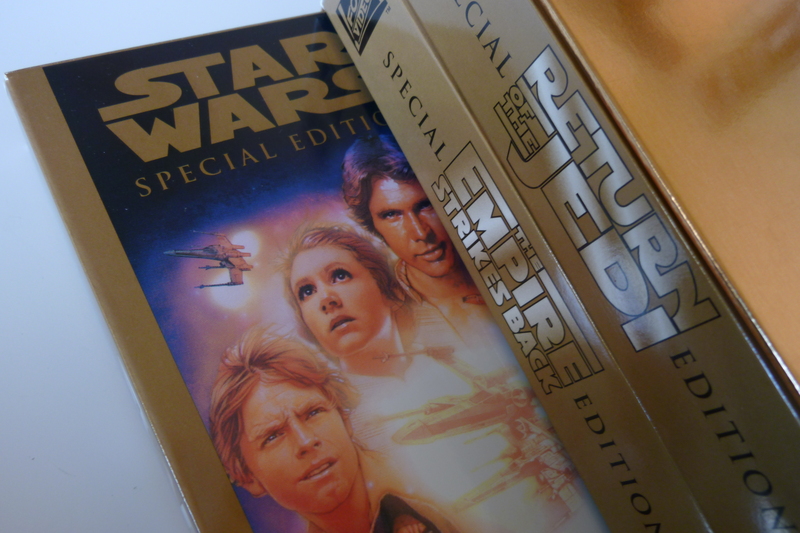 So, over a recent weekend, I dug out my very old, shiny gold Special Edition VHS tapes of the original trilogy (a very big deal purchase when I was much younger!) and rewatched all three movies over three days. And you know, they really are wonderful. The characters, the strange landscapes, the magic of the Force…even the battles. It’s often the characters that count most for me, so let’s start there. Remember it had been ten years (or thereabouts) since I saw these movies. The biggest “change” was Luke. Han is right when he’s calling him a kid at the beginning! You can’t see him the same way when you’re a kid yourself. I think you have to be older to properly see Luke’s character arc, from a whiny kid on Tatooine (he really is whiny in spots) to the serene and confident Jedi Knight. It’s the classic growth of a hero story, and it’s very well-done. I enjoyed Han’s growth too, from refusing to stick his neck out for anybody, to General Solo of the Rebel Alliance–but still with some of that scoundrel edge. The one who grows less is Leia–she’s awesome from the first moment and stays that way, whether it’s blasting Stormtroopers or making acid comments to Han. I remembered she was great, but I think I forgot just how much so. I thought other characters were excellent too–Threepio, with his constant worried commentary, gets some of the funniest lines. And at the opposite end of the spectrum, you have the looming and menacing Darth Vader. I don’t think I ever noticed before–his entrance gets more impressive with each successive movie. I wonder if they didn’t quite know what they had in the first one. I thought the plot rockets forward at a nice pace, and each time I finished one movie it made me want to watch the next one. It’s fun to revisit all the iconic lines and moments, and my memory of the later two movies may have been part of why I wanted to go on to watch them. The trilogy is also a great example of a story which is complete unto itself, despite previous events which influence the present. Which leads me around to the newer trilogy. I watched that as it came out, and I don’t think I had seen the original trilogy since watching Episodes 1-3. Rewatching Episodes 4-6 largely brought home to me how irrelevant the first three episodes really are. I don’t feel like they added anything to my viewing of the original trilogy. It was a bit interesting to see the references in the original to the past, and to know how they expanded those references, except that mostly I don’t much like the way they expanded them. If anything, the new episodes hamper viewing of the original; now when Leia talks about her mother, I’m stuck thinking about Padme’s really stupid death; when anyone talks about Anakin Skywalker, it’s now harder to think of him as a heroic Jedi when I’ve seen him as a sulky teenager who, after the age of nine, was never all that likable. And even though I like Padme, seeing Leia again makes Padme look like a poor imitation. It’s sad, really–the original trilogy points up how far the new ones fell short, and how we really already knew anything we needed to know about the backstory. If I was going to get more backstory, I think I’d rather have it about the galaxy, not the individuals. Star Wars has good character development, but not so much when it comes to races. The Wookies, the Ewoks and the Jawas are the only ones I can think of who have their species name even mentioned in the original trilogy (maybe Jabba–is Hutt a species or a title?) There are endless bizarre-looking creatures, but most of them we know pretty much nothing about. We don’t need to know about all of them–but it would be nice to know about some of them. I suppose that’s another reason I ended up as a bigger fan of Star Trek; there’s much more scope in exploring different alien cultures than there is in mopping up the last traces of the Empire.